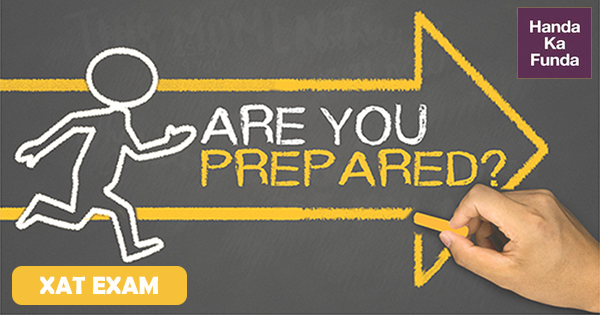 Home » Blog » Are you prepared for XAT 2018 exam? Xavier Aptitude Test (XAT) 2018: XAT 2018 exam is going to be conducted on 7th of January 2018. At HandaKaFunda we sincerely hope that your preparations are well on course for this important exam, which could very well be considered as the last resort for getting into top Business schools of India after major entrance exams like CAT, IIFT, and SNAP. Last year, XAT was conducted in approximately 47 cities across India. The difficulty level of the paper was about average. However, according to XAT officials, paper was relatively easier than 2016 XAT exam. The importance of XAT could be considered from the fact that more than 140 B-schools in India allow students to take admissions based on XAT scores. Here in this article we are going to highlight major points which could help you score more in the XAT exam. XAT 2017 paper was deemed easier than its predecessor even by the XAT officials. This year, one should expect the difficulty level to rise a bit higher. For scoring good in this section, expect some difficult questions involving complex reasoning. Basic knowledge of the common words is a must. For this, one can get hold of a reputed magazine, newspaper or books. Be willing to use new words in your day to day life. That will also help you in correct sentence formation. Also, be prepared to use dictionary for the practice. You can take help of online dictionary which are less time consuming. To improve your speed and efficiency, you can set timer for practice. Lastly, for reading comprehension, developing a habit of faster reading will really help. Also you must be able to extract out the conclusive intent of the article with the ability to judge them without being biased. One needs to get a firm understanding of the question. Also, the answers should be in accordance with moral ethics (subjected to situation). Before choosing a specific decision, make sure that your clouded judgement does not interfere with your analysis of the situation. At times of solving such questions, you may even identify yourself from some of your life experiences. Don’t let your emotions come into the way of critical analysis of the situation. Decision Making can help you improve your overall XAT score. Practice is vital though. Solving previous year question papers can tremendously help you. You can find those in our online Decision Making course. It is vital to have a firm grasp of the fundamentals from the topics of Probability, Permutations & Combinations, Number Systems and Geometry. This section needs to be answered with high accuracy. To be well prepared for Quantitative Ability & Data Interpretation, you can always subscribe to our online courses. Data Interpretation may seem easier than QA but one should have lot of practices in order to score good. Over the course of many years, we have seen many students preparing everything they could, for General Knowledge section of various exams. One thing is for certain and that is, despite of preparing everything that you may consider vital for GK preparation, the length, breadth and volume of this subject is almost infinite. Therefore, it is vitally important to be mostly aware about the major events and happenings around the world. We strongly believe that improving GK from the online videos would be much more fun and time saving for anyone’s preparation. As for Essay Writing, one thing that you must do, is to convey your opinions, perspective in the shortest possible sentences and within the allocated time. Remember, the examiner is looking for your perception and clarity of thought and coherence in your statements. So do not waste your time to write irrelevant facts, illogical statements just to make your word count higher. About us: – HandaKaFunda has been creating quality online videos for various MBA and Banking Entrance exams like CAT, XAT, IIFT, IBPS, SBI PO etc. since 2013. Our aim and philosophy revolves around providing the highest quality of education through Digital Medium.